Age-related changes and impairments can make it more difficult to understand and navigate the built environment. Impairments may include sensory, mobility or cognitive (or sometimes a combination of them all) which can affect people's functioning, behaviour, independence and ultimately, their quality of life. Forbo has partnered with Dementia Services Development Centre (DSDC), an international centre which draws on 25 years of global research and practice, to identify which products in our portfolio can contribute to improving the quality of life for people with dementia. 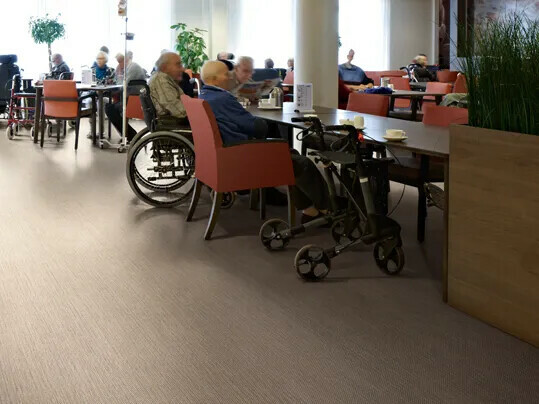 Floor covering is an essential factor in designing a dementia friendly environment as it has an impact not only on the safety and orientation of a space but when used correctly, can help provide confidence, security and independence. DSDC have rated our flooring products 1a plain and can be used indiscriminately, 1b semi-plain and can be used throughout or 2 patterned use with caution. • Tonal contrast is critical for materials to be seen against each other. • Both DSDC and BS8300:2009 Recommend a difference of 30 degrees of LRV between critical surfaces such as floors to walls and doors to walls. 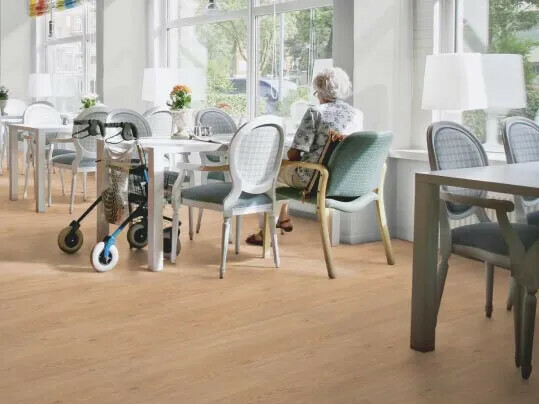 • Adjoining flooring should be tonally similar to reduce the risk of falls. • Transition strips should match the tones of both surfaces with an ideal difference of no more than 3 degrees of LRV step difference. • It is recommended that skirtings contrast with both the wall and the door where possible. 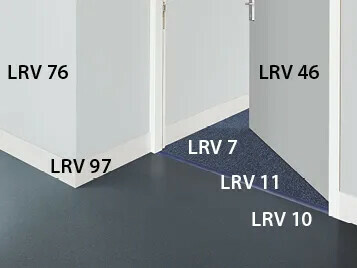 Light reflection values (LRV) are very important in designing for dementia environments. Contrast is critical between surfaces such as floors and walls and walls and doors. 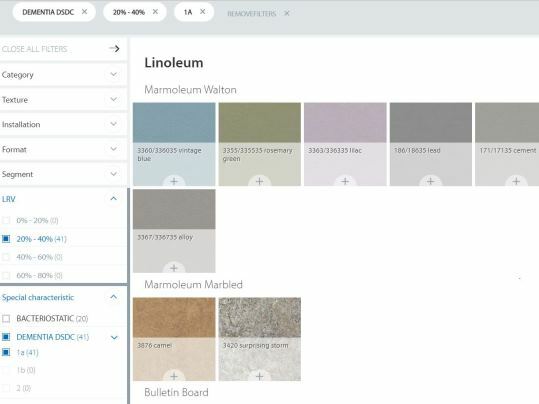 Forbo has prepared a number of Do and Don't scenarios, with DSDC based on their guidelines, to help provide a starting point for interior designs. The literature on Alzheimer is abundantly available is all languages. Websites and special interest group can point out which specialists or experts to consult when designing for special care, aged care and dementia environments. In our well being programme ‘Committed to the health of one’ we emphasise the development of our products in relation to the quality of the indoor environment and the individual using and occupying the space. By focusing on health and safety, health & hygiene and health & wellbeing it is our ambition to make a positive contribution to the indoor environment. Forbo are currently collaborating with a number of partners across the globe looking at the topic of Dementia design. Specifically we are trying to assist the design process so people can use our products to create better environments for both for patients and carers.